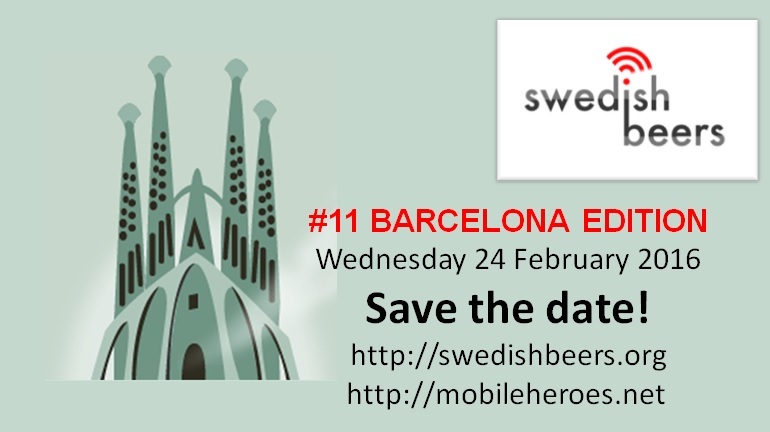 Swedish Beers is heading to Barcelona once more on 24 February! Oh, how time flies and it's the time of year when mobilists around the world turn their thoughts to the annual gathering of the great and the good of the mobile world at Mobile World Congress at the end of February. And this year is no different. 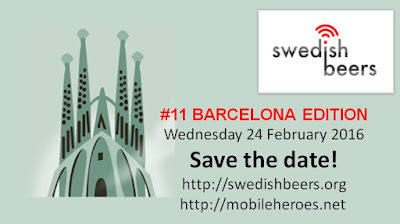 As usual, I'm running the Heroes of the Mobile Fringe Festival for the fifth time and I'm running the annual Swedish Beers party in Barcelona for the 11th time. Like our previous events, this is a relaxed evening for execs working in and around the mobile industry. You'll find no formalities, no presentations, no speeches. Just come with an open mind, be prepared to see friends old and new, chat, enjoy a drink or three (courtesy of our sponsors) and have yourself a good time. Oh, and leave the ties, the corporate personas and the sales spiel at the door please. The Swedish Beers crew will be on hand to welcome you as will the friendliest bar staff in town. Please RSVP to give me an idea on who's coming and I'll do my best to accommodate as many of you as possible. It is likely to get a bit busy at times. But don't worry, people will be coming in and out all evening. If it's very busy, there's no need to queue to get in, we'll have a second bar nearby for you to hang out in which will be just as good and where there will be plenty of people for you to network with. This does mean that I can't guarantee entry except for sponsors and the Swedish Beers Crew. I'll have some sponsor and venue announcements soon, but in the meantime, if you're at all interested in joining the fun and buying some fellow mobilists a beer or two, please get in touch with me. I have sponsorship options for all budgets so don't be shy! In the meantime, please RSVP below and spread the word to your colleagues and clients.